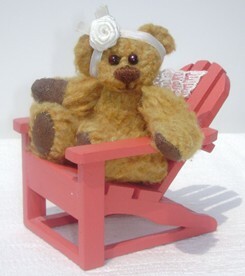 In the small town of LaSalle, Ontario, Canada, Elaine Douglas of Grannies Memory Bears has lived in her quaint little house for 45 years sharing it with her husband, Russ and raising her three children. Family is the most important thing to Elaine. "I received the special name "Grannie" from my husband when our first granddaughter, Marissa was born. The name was so special to me that I decided to retain it when I was encouraged by family and friends to offer my teddies to the public." 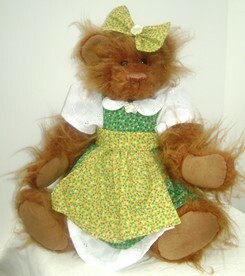 Elaine started her business in 1997 as Grannies Bears. Having learned to sew in grade school, she proceeded to more challenging projects which included her daughter's bridesmaid dresses (she raised three daughters, Christine, Wendy and Becky), curtains and anything she thought would take her to new places with her sewing knowledge. 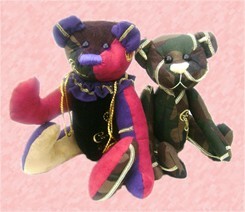 Her first faux fur teddy bear was made from a kit she ordered from a magazine. "It turned out much better than I had anticipated so I proceeded creating more styles of bears by interchanging patterns and designing until I could achieve the look I desired." Following faux fur and mohair, Elaine then went on to use genuine recycled fur. "I certainly learned fast, mistake after mistake, turned into quite a learning experience. But with extra detailing, sculpturing and a dash of patience, I got the effects I was trying to achieve." In the middle of December 2003, Elaine suffered a tragic blow when she lost her middle child Wendy. "With the horrific passing of our precious daughter I was in such a fog that even though I had a working bear design I could not begin to create any of their faces or give them any type of personality." This went on for at least six months. 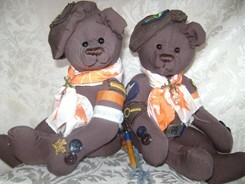 "I designed and made many teddies using Wendy's clothing and presented them to her children and to our family members." It was at this point that Elaine changed her business name from the original "Grannies Bears" to "Grannies Memory Bears." Three months after Wendy's death, Elaine reached out to the Canadian Mental Health Association - Adult Bereavement program. They taught her how to incorporate her pain into her life. With extensive training, Elaine became a volunteer facilitator for the program in the hopes of making a difference in someone else's life. "One important lesson I've learned was that the depth of my pain was an indicator of the height of my love for my daughter." Seeing the healing effect her heirloom bears were offering, that when Elaine's mother-in-law passed away, she designed teddies for all her sisters-in-laws. 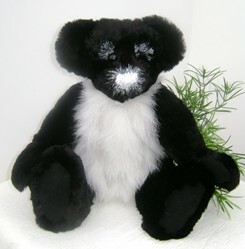 With some improvisation, she was able to create pandas for each of grieving family member. "They were precious gifts from their mother. I was simply the means to give them that loving gift." Continuing with the creation of her memory bears, Elaine then took her mother's collection of fabrics, which she received after her passing and proceeded to make her seven siblings and her mother's sister, a special teddy from a large piece of tartan. Inspired by that particular teddy, Elaine immediately introduced a line of tartan teddies into her collage of special heritage keepsakes. With the encouragement of family and friends, she began exhibiting in county fairs and juried craft shows. 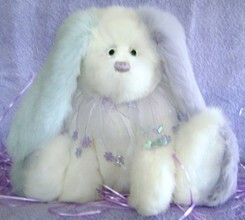 Now Elaine leans towards using her web site and online auctions to sell her creations. "I do love the interactions with the public at shows and since my main goal is to provide a service with the focus on the memory aspect, I find I can create the best quality heirlooms that bring comfort by using their irreplaceable garments." "I have been privileged to share many happy and sometimes heartbreaking stories. I find it is very rewarding to both myself and my customers who give me the honor of protecting and designing a special keepsake." Although Elaine hasn't received any awards yet for her artwork, she feels that the expressions of love and gratitude that she receives from her customers is worth more than a physical reward. "I feel blessed that I am in a position to give comfort to so many using their personal experience as a creation." 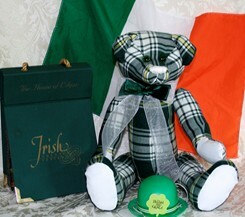 Choosing a traditional style teddy bear design, Elaine uses a loved ones articles of clothing such as uniforms, T-shirts, jeans or some other special material from a graduation or wedding event. 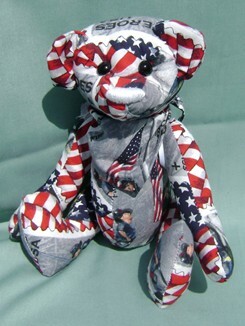 "I created a design using fabric that honored the firefighter heroes of 9/11. At a firefighter rally near our home, I was allowed to be a vendor because I had bears affiliated with the rally. I happened to meet three firefighters that were at Ground Zero in New York City," she said recalling, "I have to say, this was one of the highlights of my life." 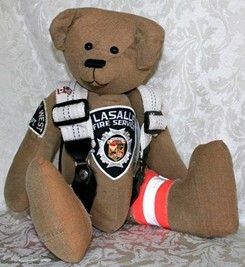 One firefighter she met, Jonathan Wright, took several editions of her teddy bear "Spirit" and raffled them at State Fairs across the US donating the proceeds to a non-profit organization that he initiated for veterans. A percentage from Elaine's sales will be donated to the veterans on any future US orders and a percentage from Canadian order will benefit the LaSalle Volunteer Firefighters as well. 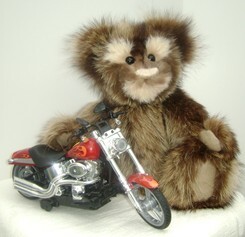 Set on taking some classes on air brushing, waxing and tea dying, Elaine looks forward to the expansion of her business and using new techniques to add special touches to the bears that touch so many. As she peruses the page of Bears&Buds Webzine, admiring the many talented artists, she remarks, "I feel honored to be a part of such an amazing community of teddy bear enthusiasts."